For virtually a decade, I’ve seen the DVD of the 2004 film Satan’s Little Helper on the shelves at Best Buy and on the product pages of movies I check out on Amazon. And for virtually a decade, I told myself that maybe when I had nothing better to buy, I’d pick it up. Finally, after a friend randomly checked it out on Netflix and told me I simply had to see it, I caved and picked it up. Satan’s Little Helper is now at the top of my list of favorite Halloween horror flicks along with Halloween and Trick ‘r Treat. First of all, I never even realized Satan’s Little Helper was a Halloween movie. And man is it! It delivers nonstop holiday spirit. It’s also directed by Jeff Lieberman, who not only did Squirm back in 1976, but is also responsible for the backwoods slasher Just Before Dawn, which I just blogged about the other day. I can now say that Satan’s Little Helper is Jeff’s masterpiece. This is an incredibly unique approach to a slasher film and has some really quirky aspects to it—thanks in large part to Amanda Plummer’s portrayal of the zany mom. She and her little son, played by a little boy named Alexander Brickel, who does an awesome job in his role, are excited that her daughter is coming back from school for Halloween. 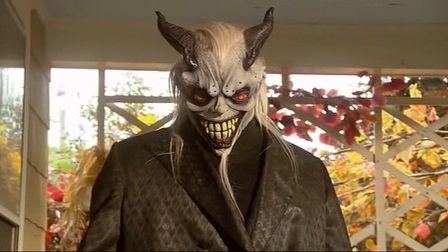 The daughter is played by Katheryn Winnick, who also appeared in Hellraiser: Hellworld and Amusement. The daughter is an acting major and brings along her new boyfriend. Her little brother adores her and is jealous of the new boyfriend. He is also addicted to a video game called Satan’s Little Helper in which you score big time by helping Satan do awful things to people on the street. 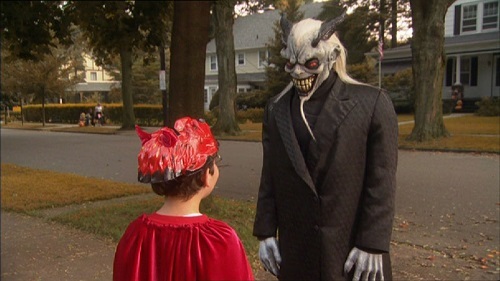 There’s no suggestion that the video game Satan comes to life, but when the boy goes trick or treating by himself, he comes across a guy dressed in a freaky Satan mask (yes, the DVD cover image), propping a dead body on a porch as a Halloween decoration. The imaginative boy thinks it’s all a game and tells the masked Satan that he wants to be his assistant just like in the game—and wants Satan to help him get his sister’s new boyfriend out of the picture. Holy crap! This is a creepy and darkly comic movie that keeps you watching. Just the concept of this little boy trusting completely in a masked stranger—and taking him HOME—is chill inducing. The man behind the mask does an amazing job of using only body and head gestures to get his messages and his intentions across as he takes the little boy on his killing spree. 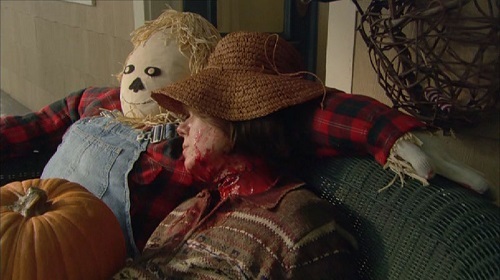 And some of the “fun” they have, which the boy thinks is merely fake Halloween prank fun, is just so wrong! This movie is virtually perfect. There are some extremely noticeable issues in editing and continuity, such as Satan locking the door then mom coming along and opening it without having to unlock it, but these minor flaws give it that charming indie quality. The only part that kind of hindered the tone of the film a little was a sequence at a Halloween party, which felt a little out of place. But things come back to the core group of characters for the eerie conclusion. There was also an odd decision made for the shot that closes the film. I can’t discuss it without giving things away, but it kind of makes no logical sense and I personally think it was a bad decision. 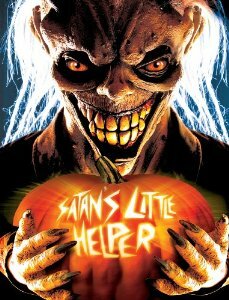 I seriously cannot believe Satan’s Little Helper has not gotten a huge cult following in the past ten years. 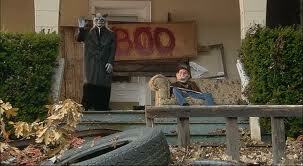 This one should be a Halloween staple for any horror fan. This entry was posted in Movie Times & Television Schedules - Staying Entertained, The Evil of the Thriller - Everything Horror and tagged Satan’s Little Helper, slashers. Bookmark the permalink.